Happy Monday! 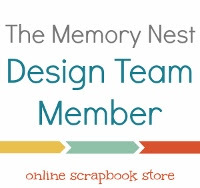 Here is my layout for the Memory Nest. We just got back from our trip to Walt Disney World. We weren't going to do any character things, but my daughter put this wookiee shirt on when we went to Hollywood Studios. There isn't a ton for little kids to do there and the line was short to see Chewbacca. He was so much fun and was one of our favorite experiences from our trip. The layout is simple, but looks cool in person. I didn't want to over do the layout since it had so much stitching on it, but I might go back and to a little boarder around it.